The Brod Firm is proud to support the Northern California bicycling community, including the SF Bike Coalition and the Marin County Bike Coalition. While we are also proud of our work as an experienced San Francisco bicyclist’s law firm, we hope that attention to safety on behalf of motorists and the cyclists themselves will save lives, prevent injury, and make this work increasingly unnecessary. 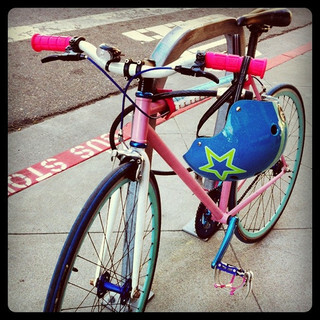 Bicycle helmets do not, as a general matter, prevent accidents. Driver attentiveness would be a much better tool for that end. However, helmets are important safety tools that can help reduce the severity of injuries and prevent an accident from becoming a fatality. On Thursday May 23 at around 6:45 a.m., per a report by the San Francisco Chronicle, twenty-one year old Dylan Mitchell was riding his bicycle in the Mission District. He was headed east on 16th Street when he collided with the rear of a Recology garbage truck. The truck had also been travelling east on 16th and had begun to make a right turn onto South Van Ness Avenue and collided with the bicycle and its rider. Mitchell, who family members say had just moved to San Francisco a week before order to begin an apprenticeship at the International Brotherhood of Electrical Workers, died at the scene. Police are investigating the crash and do not believe alcohol or drugs were involved. Reports indicate Mitchell was not wearing a helmet and was riding at a “high rate of speed.” The intersection is equipped with a four way traffic signal. We cannot comment on the cause of Thursday’s crash, but that does not mean we cannot draw an important safety lesson from it that might help prevent or, at least, limit future tragedies — Bicycle helmets should be standard equipment for riders of all ages. The Bicycle Helmet Safety Institute is a relatively small non-profit, but one that has gained enough respect to be cited on helmet issues by the National Highway Traffic Safety Administration. While admitting that precise numbers vary by source, BHSI’s Statistics Page finds that 91% of the 628 riders killed in 2009 were not wearing helmets at the time of their accidents. Overall, the use of helmets has been found to reduce head injury risk, the cause of the most serious injuries incurred in fatal bike accidents, by an extremely significant 85%. These numbers come from the Insurance Institute for Highway Safety (“IIHS”), a group that BHSI suggests is the best online source for statistics on bicycle fatalities. BHSI also cites U.S. Department of Transportation figures finding that 2011 saw 677 bicyclist fatalities and 48,000 non-fatal traffic injuries to riders. After an accident, the top priority should always be medical care. However, riders injured due to someone else’s negligence should also contact legal counsel as soon as practicable. While we encourage all riders to wear helmets, injured riders should not fear that their case will be overlooked because they had not been wearing a helmet at the time of the crash. Call to arrange a free consultation with our San Francisco bicycle injury attorney to discuss the unique facts of your case and how California law applies to your situation.